The Personal Wealth Builder Solution is designed to capture your dreams, values, lifestyle goals and personal financial objectives. Out of this process emerges a customized financial plan with strategies to help you grow your assets while protecting your family against loss. Our process begins with an interview designed to capture your dreams, values, lifestyle goals and personal financial objectives. 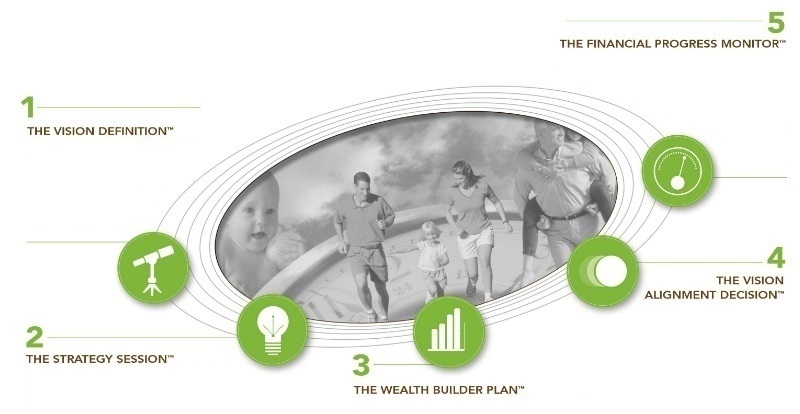 Out of this stage emerges a customized financial game plan that will guide the tailored recommendations in your Wealth Builder Plan™. In the Strategy Session™, we build a detailed financial profile so that we may understand your personal balance sheet; help you identify risks, opportunities and strengths; understand your current asset allocation; and help you develop your financial parameters. By simply organizing your financial documents and records, you may gain confidence in knowing where you’ve been and where you’re heading. Connecting goals to action, lifestyle to finance, and dreams to results, we prepare practical recommendations delivered in a unified and understandable plan. Our process involves stringent protocols for researching and testing financial models, careful analysis of combinations of solutions, and coordination with your other financial advisors. With goals in sight, great care is taken to ensure that your implemented plan is aligned with your vision. As your advocate in the planning process, we employ specialized analytical models to provide a thorough and objective evaluation of possible funding methods such as investments and life insurance. To perpetuate what you have accomplished through this process, we establish regular reviews to gauge your plan’s performance, and make adjustments for changing laws, regulations, market conditions, and investment performance. The review also takes into account your changing personal and financial circumstances.